A great smile is essential for putting your best face forward. At Bozeman Dentistry, we not only restore teeth to their original condition; we make many Bozeman smiles better than they ever were before! Some patients have only a few problems they wish to correct. Perhaps one or two teeth are misshapen and seem out of alignment. If the problem teeth are only superficially crooked—meaning they do not need to be moved into place with orthodontia—porcelain veneers are often the answer. Veneers are wafer-thin, porcelain shells that are attached to the front of one of more teeth. They are extremely versatile and can correct shape, color, or both. Another plus: porcelain veneers are essentially non-invasive and do not affect healthy tooth structure. 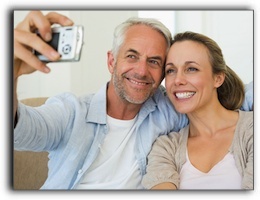 Some of our Belgrade and Big Sky dental patients were happy with their smile in years past but now want to bring up the whiteness a notch or two. Teeth whitening is a popular procedure for our Livingston cosmetic dentistry patients. We provide a variety of teeth whitening options for every type of smile. If you are ready to brighten your smile, come on in; we’ll help you find the best tooth whitening system for your smile. Put your best face forward with a brand new smile!